The creatives at Weta (District 9, The Lord of the Rings) have embarked on a remarkable novelty project to help a middle aged double amputee named Nadya Vessey. Ms. Vessey was born with a rare condition that stunded the growth of her legs, resulting in double amputations before she reached 20. Despite such tragic circumstances, Vessey has cultivated a lifelong passion for swimming. It took the prospect of an upcoming triathlon and a peculiar encounter with a little boy to inspire her mermaid idea. Thanks to Weta, it’s now a reality. 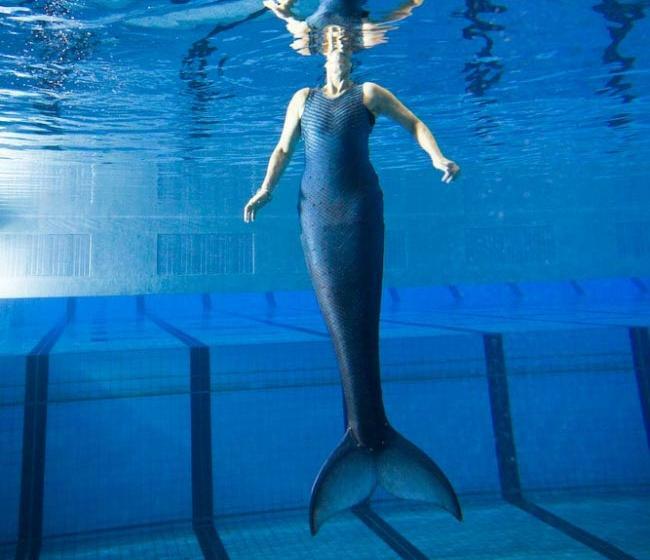 Their talents better suited to elaborate movie sets and assorted fantastical accoutrements, the designers at Weta took to the prosthetic swimming fins with gusto. With the help of 3D modeling and a special skin print for the ‘scales’—not to mention some engineering smarts–the team have created the most detailed mermaid fins to date. As the picture up north suggests, Ms. Vessey loves them. Every aspect of the tail has been custom made to Vessey’s body using a blend of 3D modelling and milling technology, combined with Vi Vac vacforming, and a poly carbonate spine and tail fin. The skin of the tail has been made from a layer of neoprene and a lycra outer-layer digitally printed with a stunning ‘scale’ pattern, that was designed by one of our concept artists.